We were sitting on the wooden stairway leading to the beach at Leentjiesklip (Langebaan) eating fish and chips with our fingers. An icy south-western wind tried to drive us into the cars like the rest of our entourage but we refused to budge. What a memory! Needless to say, back at our tent with the wind still blowing strong I had to make myself two hot water bottles and got under the covers to warm myself up. Frans and I looked at the pictures on the camera’s screen with the voices of the others talking and laughing in the neighbouring tent. That’s how I fell asleep on 3 September 2012 – totally content surrounded with loved ones and knowing that I had beautiful pictures to enhance a special memory! Can you imagine a more beautiful end to a special day? I used the alphabet to create words that compliment the pictures. Blue Distress Ranger Ink and a script stamp transformed the letters into grungy words and tied it in with the blue background. 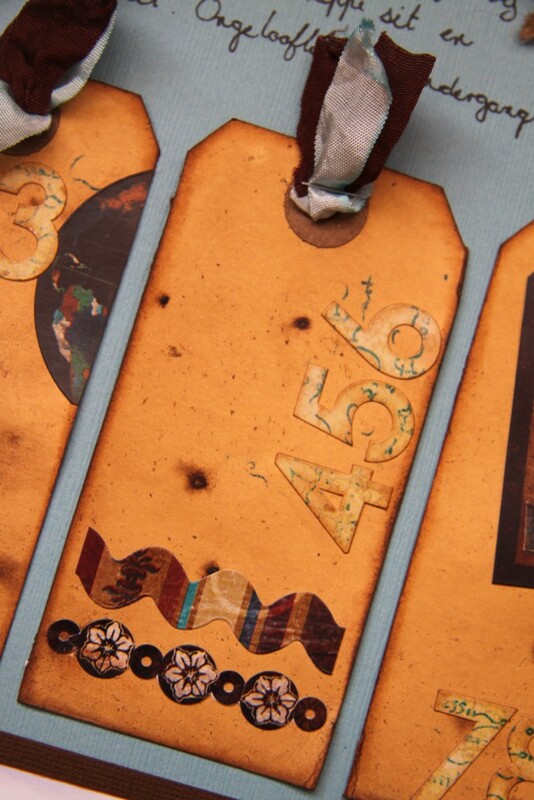 Manilla tags dyed with walnut ink were treated to numbers with the script stamped on them as well as stickers and parts of stickers. I am looking forward to scrapping with you on 29 September 2012 and would love to show you more of the beautiful pictures we took during our tour of Namaqualand and the West Coast! 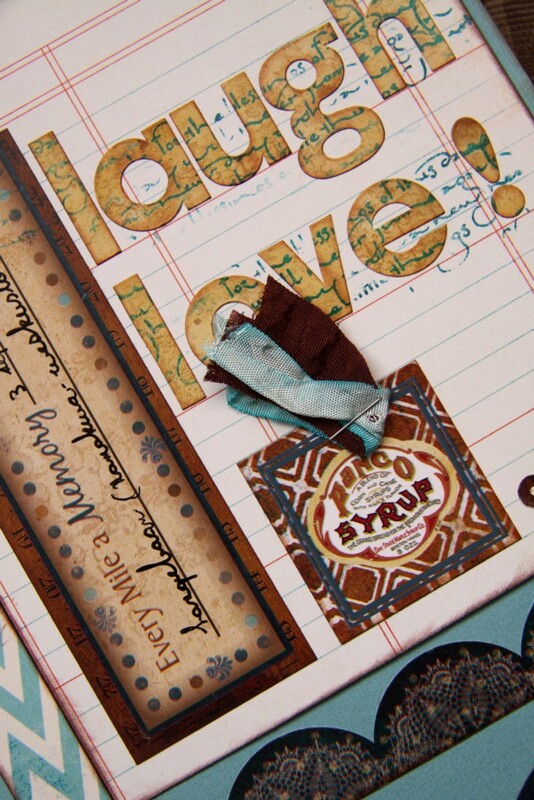 Putting together my layout for Saturday’s class made me happy because I love Kraft paper as a background. 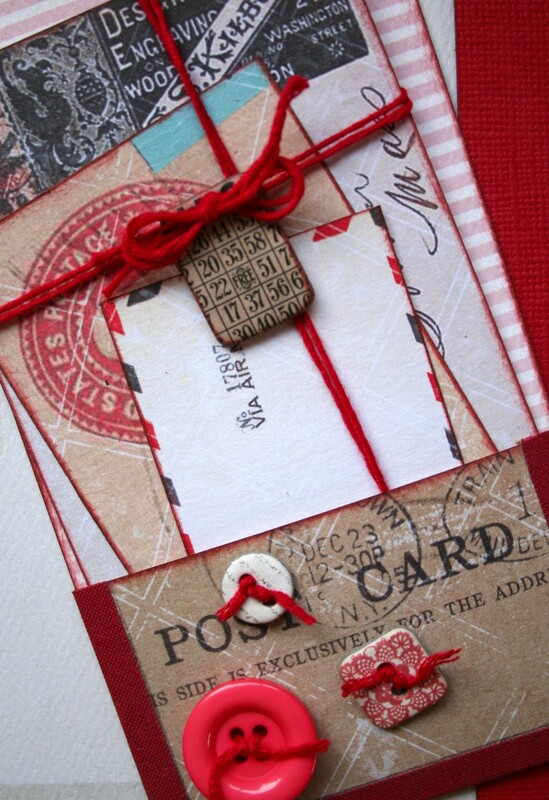 Most printed paper you can think of will work on Kraft paper because of its muted colour. 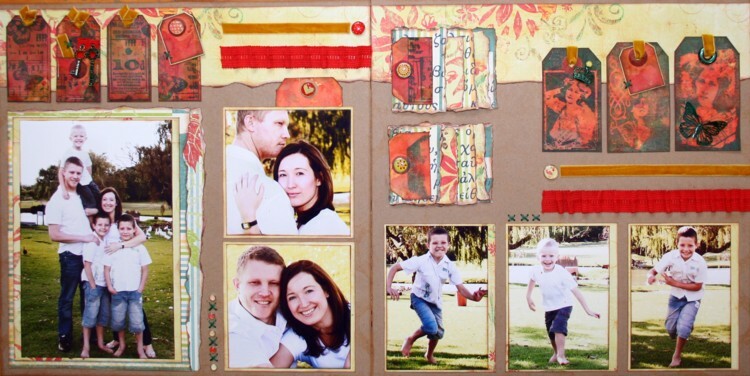 the double page layout for this week is about family and I combined 7G and Fancy Pants paper on the Kraft background. The tags started out as ordinary post office tags but when I got my hands on my Ranger distress stains the colour changed dramatically. 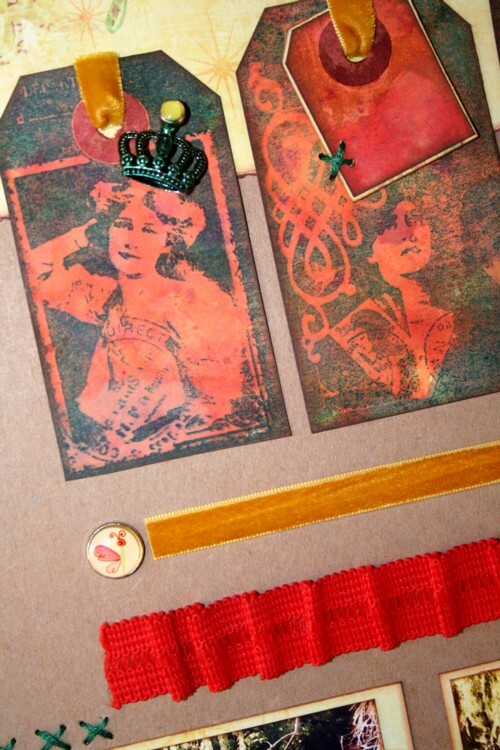 I used a few colours to get the effect I wanted and when they were dry I stamped onto the tags with Crafty Individuals stamps. 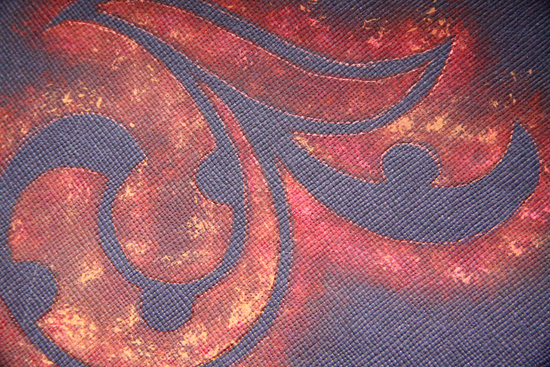 A variety of metal embellishments – that I coloured with alcohol ink to get the right colour – add interest to the tags. If you look closely you can see that the crown has the same aqua colour of the embroidery thread that I used to make cross-stitches in various places on the layout. Embroidery thread always adds warmth and a homely feel to a layout (I promise I don’t use it to irritate you Lorraine 😉 ) I love the rich colours of the trims that complement the papers beautifully. So come and play with me on Saturday and together we will drive the winter blues away! I sometimes experience a moment in life when I want to chip away the walls around my heart and allow softness to creep in. But then a magic moment happens unexpectedly and I have the opportunity to align myself again with the people around me. That is when I make notes in my head about how things should be. How I should treat others (mostly my husband) and nurture them and what we have together. 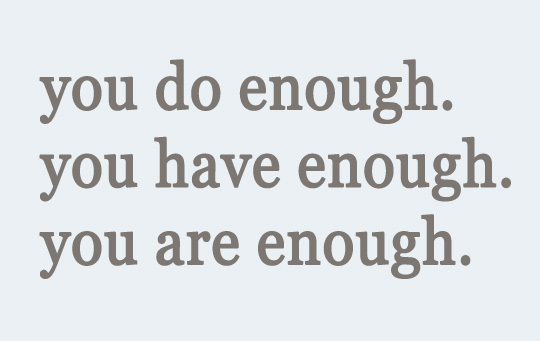 My layout this week is about those notes to myself that I wish I could live by every day! 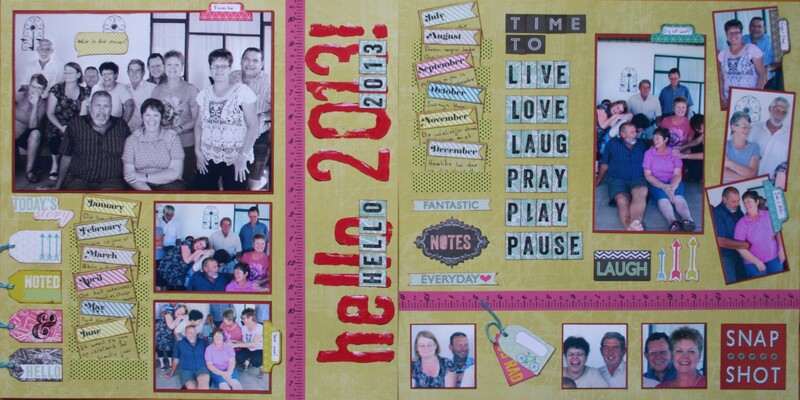 My layout was inspired by one that The Scrapbooking Den did on their Mayday Mega Crop. I haven’t used Basic Grey in a looong time and the colours of the paper complemented my pictures perfectly. 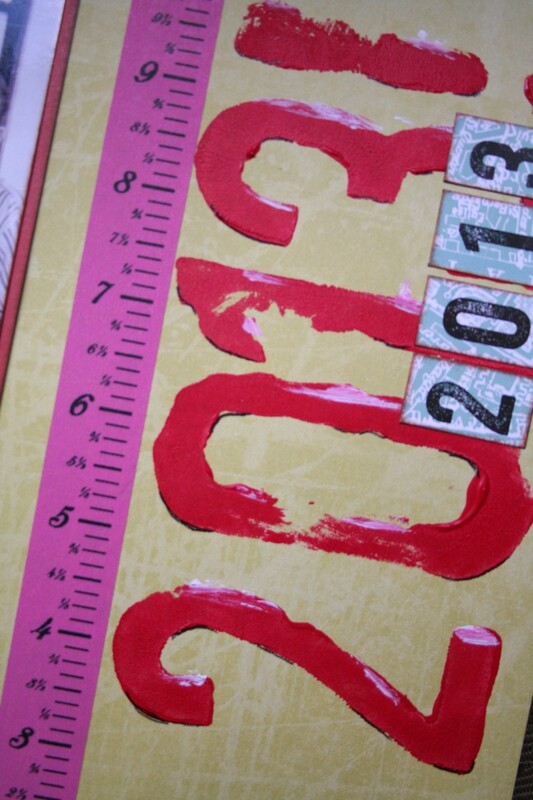 The journaling strips are from Cosmo Cricket and I used it throughout the layout. 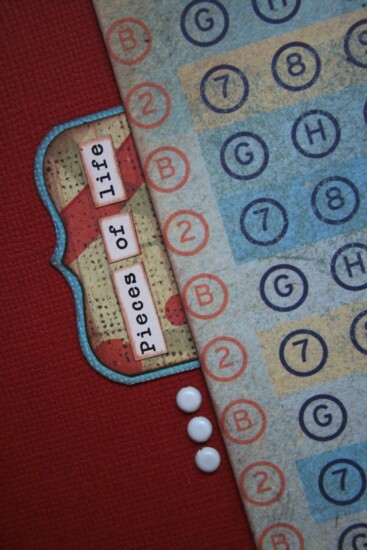 The title is printed on a transparency, painted on the back and stuck to the page using the paint as adhesive. Four cream brads define the edges of the title and is repeated next to a tab on the left page. The trim is from Making Memories and I dyed it to match the colours of my layout. 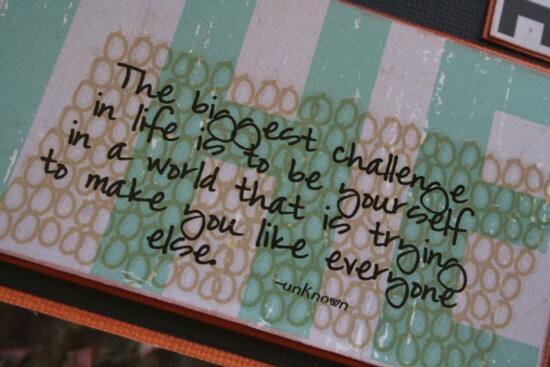 Only by the age of forty had I mastered the art of being true to myself. Before that I used to tear myself in a million pieces trying to please everybody else. I found some wonderful neck exercises that helped catapult myself into being myself – I learnt to shake my head from side to side. I learnt to say NO. NO to things other people expected from me that they could do for themselves. NO to unreasonable demands from others. NO to unnecessary things I ‘had to do’ stealing my time. NO to people sucking every ounce of energy out of me, leaving me spent and too tired to spend quality time with my family. 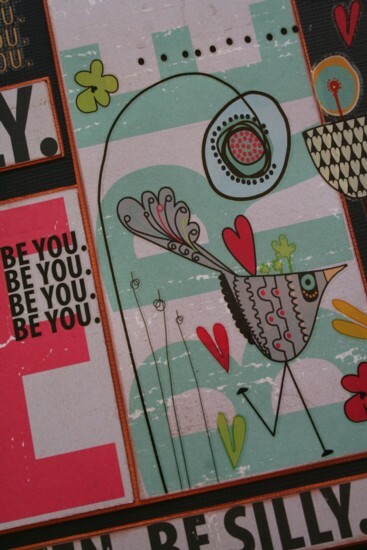 With whom I can just be myself! Over the Easter weekend we had our annual family get-together and we spent a lot of time catching up and of course just being ourselves 🙂 My younger sister and I are very close and can be quite goofy when we are together. On Sunday afternoon we hiked to the waterfall in Kgaswane (near Rustenburg) where we were camping and everybody had to be photographed with the waterfall in the background. When it was our turn she caught me unexpectedly from behind and started kissing me passionately on the cheek. 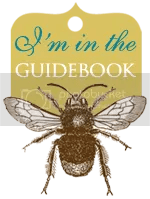 Mary-Ann was ready with her camera and clicked away, capturing precious memories that I used on my layout for this week. The layout was actually completed before the weekend and the pictures went very well with it. 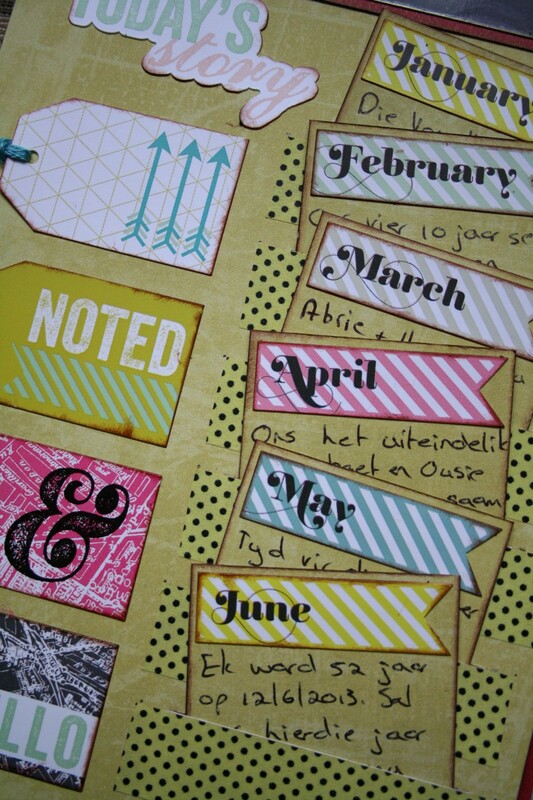 I used paper from the new Fancy Pants range as well as their beautiful matching rub-ons. I already practise most of the phrases on the page but there is at least one that I really need to work on: ‘Forgive Easily’. Why is that so difficult fo me? Maybe because I am being my stubborn self! Aaahh… and how joyful is the duty of love when you’re young and your heart is beating in unison with your sweetheart’s! It is an added bonus if your sister is a photographer because then you can have the most beautiful pictures as memories of a summer spent in love. It doesn’t get better than that! 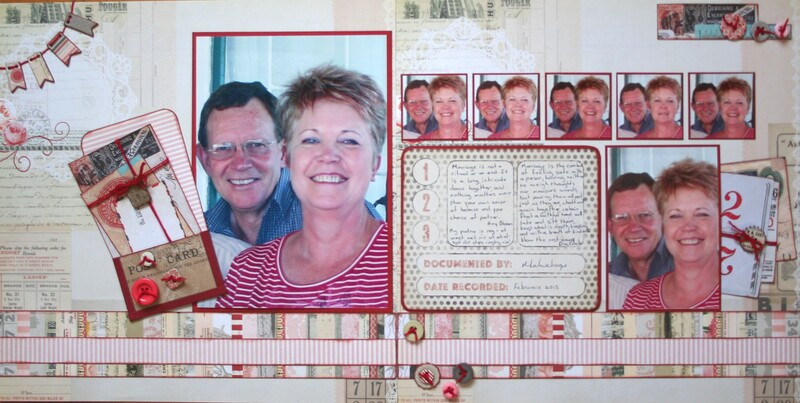 The title of my double page layout for this week is ‘Memories’. The tags are from 7G (Oh, I do love them so!!!) and I cut the numbers off the bottom of the tags and put two layers of embossing enamel on them to deepen the colour and add dimension and shine. Then I stapled the numbers back onto the tags in different positions and used them to slide small black and white pictures into. 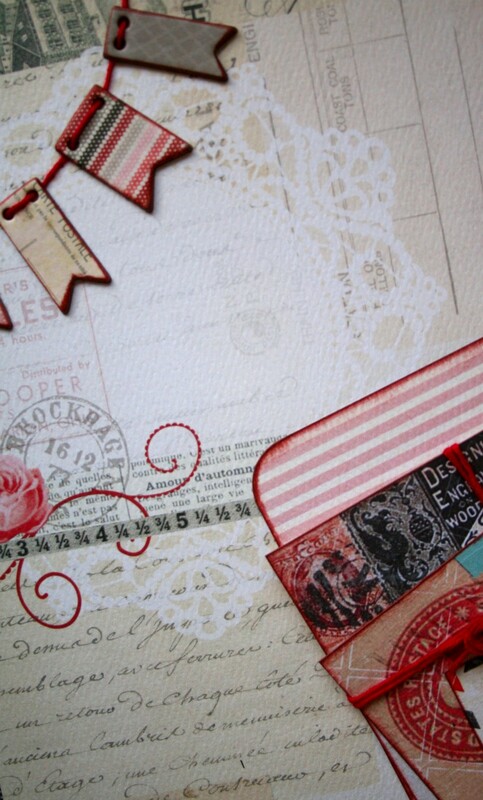 The tags were fastened to the layout with an assortment of brads to add to the shabby chique feel of the layout. Masking is something that have always fascinated me and I used two different flourishes to create images on the background. This technique is really simple to do: just hold the flourish (or whatever mask you’re using) firmly in place and then use a stippling brush to apply the layers of colour. Three colours of paint are usually enough to give depth to the colour of the image. I used ‘Red Oxide’ from Chromacryl as a base and layered ‘espresso’ from Making Memories on top of that and just a teensy weensy bit of ‘Cool Red’, also from Chromacryl, on top of the other two. 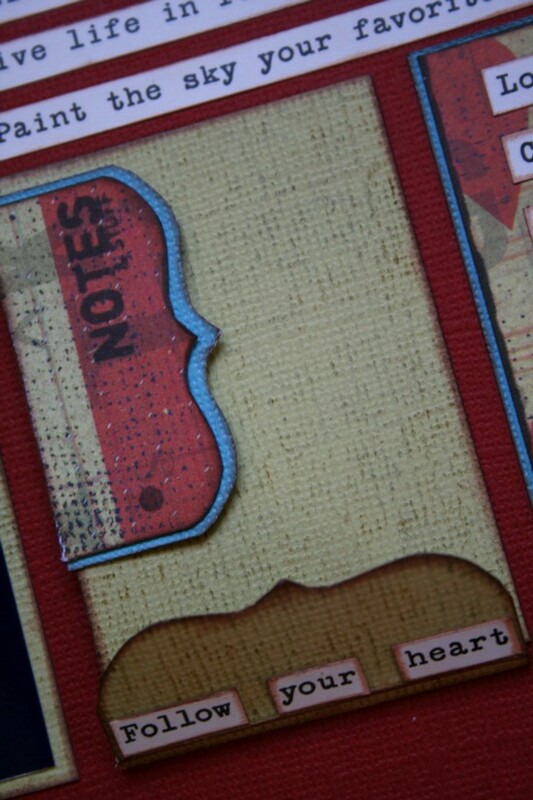 The title of my layout is ‘Memories’ and it is ordinary chipboard that I painted with ‘Red Oxide’ and then I stamped onto the paint with Staz-on ink an a dictionary stamp. 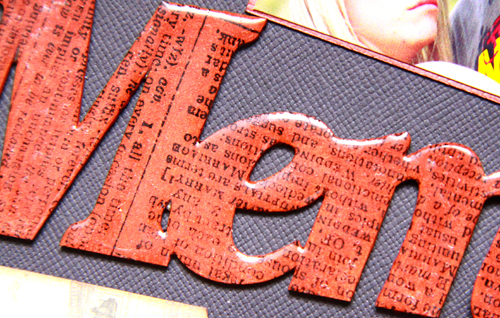 Two layers of clear embossing enamel provides the finishing lustre to the title. 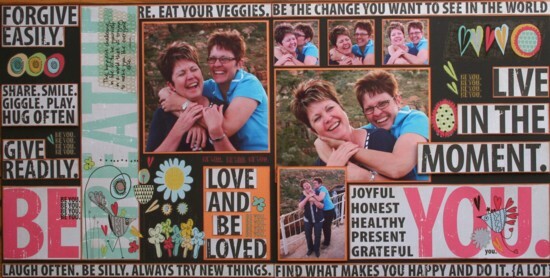 Lastly I added the beautiful pictures to complete the page and ta-da!